"Let me show you something interesting..."
Timeless Media Group presents all 78 episodes of the groundbreaking Science Fiction Theatre in a 9-DVD box set on May 12, 2015. 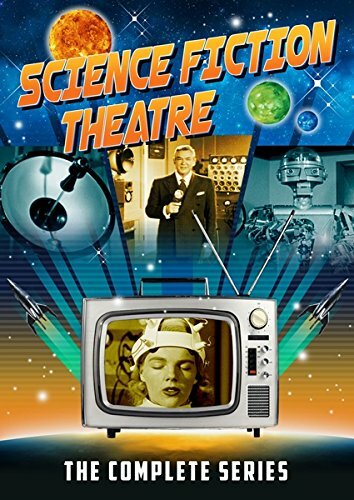 Presented for the first time on DVD, this complete series collection of Science Fiction Theatre is an entertaining look back-and-forward- to the way science shapes our views of the world's potential. Blending the discoveries of factual science with the limitless frontiers of fantasy, Science Fiction Theatre offered Atomic Age television viewers an intriguing look at the possibilities science could provide us in the near future as well as the immediate present. Airing from 1955 to 1957 and hosted by Truman Bradley, Science Fiction Theatre 's seventy-eight episodes presented its intelligent and fantastic stories in an anthology format, pre-dating The Twilight Zone and The Outer Limits. Guest stars on this unique program feature a roster of actors well-known to any lover of classic film and television, including DeForest Kelley (Star Trek), Hugh Beaumont (Leave It To Beaver) Barbara Hale (Perry Mason) Gene Barry (The War of the Worlds, Burke's Law), Macdonald Carey, Edmund Gwenn (Miracle on 34th Street), Beverly Garland, Basil Rathbone, June Lockhart (Lost In Space), and the great Vincent Price. Other guest stars include William Lundigan, Douglas Kennedy, Don DeFore, Warren Stevens, Otto Kruger, Vera Miles, Richard Arlen, Marshall Thompson, Howard Duff, Whit Bissell, Adolphe Menjou, Macdonald Carey, Ruta Lee, Skip Hoemier, Bruce Bennett, Diana Douglas, Arthur Franz, & Lyle Talbot.